There’s a simple recipe for taking your Branson vacation from memorable to absolutely unforgettable: Just add water! With clean, scenic lakes and thrilling water parks focused on family fun, a Branson vacation has more than enough water-based fun to keep visitors swimming, splashing and smiling from sunup to sundown. Need help getting started? Pack goggles and enjoy these Branson water parks, lakes and swimming spots on the next adventure. Spending a day at Branson’s Moonshine Beach on Table Rock Lake is a great way to enjoy the water. 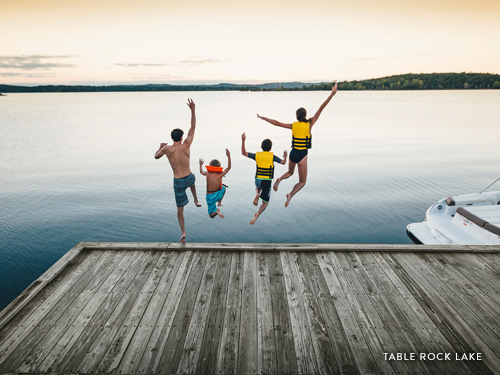 The clear waters of Table Rock Lake are great for swimming, boating and fishing. At Moonshine Beach, enjoy a dip and the natural beauty around while lounging on the sand. Branson’s White Water Water Park has riders screaming with delight. Kapau Plummet features two 245-foot slides that start with a pulse-pounding experience: The floor drops out from underneath, sending riders down the slide at 26 feet per second! Castle Rock Resort’s water park has several great amenities, from slides to tipping-buckets, but it’s hard to beat a leisurely ride around the lazy river feature. It’s the perfect break from the business of summer and a great way to slow down and appreciate the company of that special someone. The clean, clear waters of Bull Shoals Lake makes it a fisherman’s dream and great place for scuba diving. Yes, scuba diving! With more than 740 miles of shoreline, the options for fun on Bull Shoals Lake are abundant. Don’t’ forget to pack flippers! On Lake Taneycomo, enjoy the challenge of landing trout at one of the Midwest’s best trout fisheries. Not a fisherman? Try adventure of a different kind by contacting a local outfitter and renting a stand-up paddleboard. These are just a few ways to enjoy the water in Branson. Make sure to check out Lakeside Dining in Branson!